Quick Summary: An aspiring author falls in love with a charming man and moves away with him to his house. However, things are not all right with the house, as the ghosts of the past still remain. Release Date: 2015-10-16 (US, UK). This movie managed to pique my interest from the first time I saw the trailer. It was an interesting looking horror film starring Tom Hiddleston, and it didn't really tell much about the plot. I —and I imagine other people too— was interested in how Loki would fare in a ghost movie as a normal human. Well, despite both the trailer for the movie and the film itself opening with the line "ghosts are real, this much I know," this film is less a ghost story, and —as one of the film's characters says about her own book— more a story with ghosts. While ghosts are present, they don't take center stage in the movie. In fact, they don't even appear much at all for the film's first half. For that matter, this film is more a drama/fantasy movie than a through and through horror flick. Don't be mistaken though: it is a horror film, though just barely. Don't expect it to scare you shitless (the director considers this movie to be gothic romance, not horror). 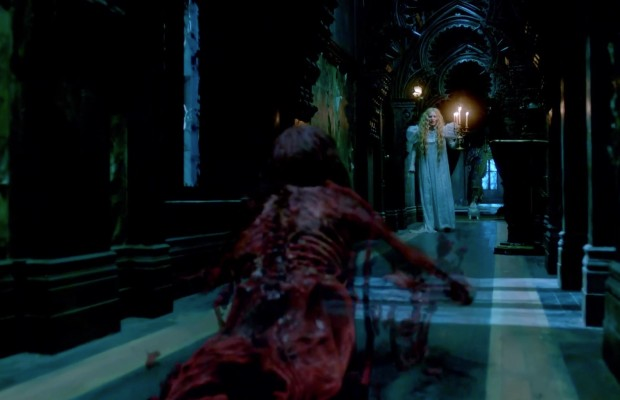 Alright, let's talk more about the story of Crimson Peak. The film centers around Edith (Wasikowska), an aspiring author and the daughter of a wealthy man. Meanwhile, Thomas and Lucille Sharpe, brother and sister, and heirs to the now squandered Sharpe family fortune, start seeking benefactors so that Thomas can build a machine to help mine the valuable ore that rests under the land upon which he and his sister live. You can probably figure out from just those sentences how the first act of the film unfolds. I won't detail the events themselves, but suffice it to say it ends with Edith moving to her lover's home. This house is where the majority of the film takes place, and there are things about the house that are not quite right. Edith sees ghosts at night, and there is a sense of foreboding. I won't say more than that, as that'd spoil the film. The film is well shot, and visually looks very nice. It carries a Victorian flair, and then in the second half a strong gothic element. The colour red decorates the entire film: the backdrops, the landscapes, and even the blood-covered ghosts. I've not seen much of del Toro's work, but having seen Pan's Labyrinth is enough to tell that this film has his fingerprints all over it, as it carries much of the same style. Crimson Peak is a good movie, but going into it you should know what kind of film you're getting. From talking to other people that have seen the film, it seems the most common criticism pertains to how scary it is: not that much. So while I think it's worth watching, know that the horror takes a back seat to the rest of the film's elements. But it's nonetheless a good movie.